Jetmore is located at the junction of Highway 156 and 283 in southwestern Kansas. The Jetmore Curve is located about 3 miles west of Jetmore, Kansas along a gravel road. Jetmore is a small town of about 1,000 residents. 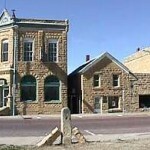 It is the County Seat of Hodgeman County. The city of Jetmore was founded in 1879 and was originally known as “Buckner” but the name was changed to Jetmore to honor the lawyer (named Jetmore, of course) who helped to get the city the title of County Seat. Back in the 1800’s, it was a fairly big deal for cities to be dubbed the county seat. The county seat would have greater economic possibilities in its future. Thus, the residents of Jetmore (once “Buckner”) were excited and grateful to the lawyer who made it possible for their community to have this special economic boost. About 3 miles west of Jetmore, Kansas, there is a big curve along a gravel road where, locals claim a group of kids died in a tragic car accident. Jetmore locals state that said car accident took place on a Halloween night and that an anniversary-type haunting occurs at this curve each and every Halloween night. This Halloween haunting is said to include the disembodied sounds of kids screaming to the accompaniment of car sounds, that come from out of “nowhere”. Interestingly, a place known as “Smitty’s Curve” exists in Geneva, Nebraska and has similar reports as those noted for Jetmore, Kansas associated with it. For example, there is a curve in a dirt road that is said to be haunted due to a car accident caused by reckless driving. However, Smitty’s Curve has other special details associated with it that Jetmore’s curve lacks. At Smitty’s Curve, there is a bridge and supposedly honking one’s horn in a special way can lead to a variety of paranormal events. This facet of the haunt is more reminiscent of the haunting at Brubaker Bridge in Gratis, Ohio. In the Smitty’s Curve story there was also a hanging in a nearby barn. The Jetmore, Kansas curve is associated with paranormal events mostly said to take place on Halloween night, while Smitty’s Curve can produce paranormal events anytime, with the right formula, according to Geneva locals. Although Smitty’s Curve and Brubaker Bridge and the Jetmore, Kansas Curve have a lot of differences, they are also similar in that both involve sharp curves along a dirt road and the element of kids driving too fast or recklessly and losing control of their cars. It is, of course, recommended that visitors to this location drive their cars with care.